She knows it’s cold. The snow is falling and the wind is blowing. She is bundled head to toe in good winter gear. Except for her hands. Her hands are bare. They must be bare. She needs her electrically-charged hands to work her smart phone. Maybe her hands are cold. Maybe they are not. She walks on. 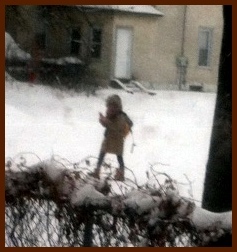 She is oblivious to the unshoveled snow on the sidewalk. She stops intermittently to stare at the smart phone screen even harder, perhaps the glaring brightness of the snow is affecting the visibility. Technology will not be denied. A few weeks ago I saw a fellow riding his bicycle with no hands so he could smoke and view his smart phone at the same time. Around the same time I saw a young woman riding her bicycle but she had enough sense to have one hand on the handle bars as she stared at her smart phone. Though she was weaving so terribly I could hardly watch for fear of the accident waiting to happen. I started thinking what ever happened to being in the moment. To just BE riding your bicycle. Or to just BE walking to the bus stop. Then I thought maybe the definition of being in the moment needs to change. “Do Androids Dream of Electric Sheep?” comes to mind as I think this. I am sure there is a reason for this but the connection is fuzzy. Perhaps being in the moment (I keep mistyping moment as monet as some sort of Freudian slip) needs to be more about being one with your technology, the technology that is now an extension of you. It’s the inevitable evolution of man and machine. The whole is greater than the sum of its parts. Being one with your technology is more important than being in tune with the mundane act of walking or riding a bicycle. The fact that you even have to walk or ride your bicycle anywhere is lingering relic of old society. Perambulation will become obsolete so that in 20 years hipsters will return to it with their ever present quest to make the arcane cool. I should write my prophetic near-future novel right now that I will name “Do Humans Dream of Perambulation?” A world where being in the moment will be something you need to escape. Is that future exhilarating or is it frightening? This entry was posted in Freedom, Personality and tagged being in the moment, Bicycle, Electric sheep, perambulation, smart phone, Snow, Technology. Bookmark the permalink.